My one biggest weakness when it comes to careless spending is making the big mistake of 'popping into Boots'. As soon as I enter those automatic doors its like some kind of dark force takes over my body, all financial awareness goes out the window, and my brain screams 'I MUST HAVE EVERYTHING'. Whether it be nail varnishes, drugstore brand makeup (which I never even particularly use) or most commonly, the newest shower/face/body products, I literally feel like I'll die unless I buy it right there and then. It's pretty apparent I've got some serious Boots related issues, but on the plus side, I've recently discovered some really great little gems which I thought you might be interested in reading some mini reviews of. 001. 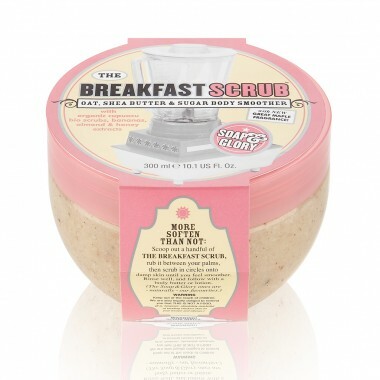 Soap & Glory - The Breakfast Scrub. OHHH MYYY GODDDDD. Every so often you come across something and know that you're going to keep buying it forever and ever and ever! I literally cant even convey how in love I am with this product. It has the most heavenly and divine smell I've ever come across in a bath body product, Ive basically had to restrain myself from eating the damn stuff. Ive been using this for a few days now and I've already noticed a great difference. It's a large grain body scrub, made with oats, shea butter, sugar, bananas, almond and honey, and after each use you get out the shower smelling like the most delicious of flapjacks, which sounds a little odd but its honestly amazing. I'm actually sat here smelling it as I write like some kind of scrub addict. I was a little put off by what seemed a high price to me, at £9.45, and for a Soap & Glory product which usually disappoint me a little, I was reluctant to spend so much. But seriously, if you have £9 going spare, I cant think of a better way to spend it! 002. 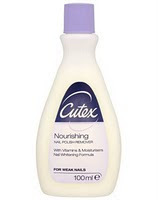 Cutex - Nourisihing Nail Polish Remover. This seems like a super boring thing to post in a post because its such an essential, but if its possible, I've fallen in love with a varnish remover?! Normally I hate taking my polish off because the smell is so overpowering and horrid, but this one smells vaguely lovely? Kind of like cocoa butter. Also it was just over £2 so it was a bargain, and does the job really well. 003. 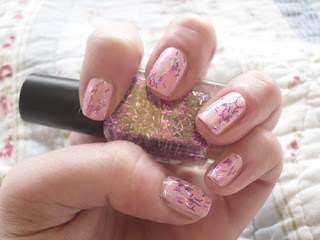 Barry M - Once Upon A Time. This is the tackiest, trashiest most hilariously great nail varnish I've ever seen. The picture doesnt really do it justice at all, it's like a little jar of sparkly hundreds and thousands! I've been using it as a top layer to add a tiny bit of magic to boring basic manicures, but once I used about six layers and built up a total coverage of just the sparkles and it looked AMAZE! Just like all the other Barry M shades, its cheap as anything, covers really well and doesnt chip too drastically. Great stuff. 004. 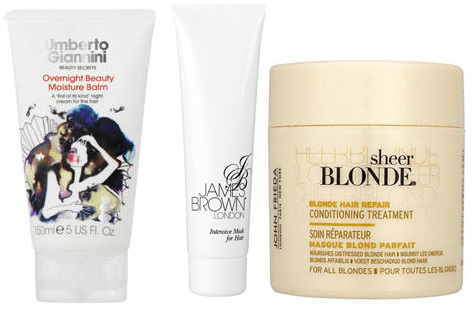 Umberto Giannini - Overnight Beauty Moisture Balm, James Brown Intensive Moisture Mask, John Frieda Sheer Blonde Conditioning Treatment. At the moment in Boots there's some really great 3 For 2 deals, across all hair ranges and all skin ranges, so it's a really good time to try out any new products that you've been meaning to, as I got all three of these reasonably expensive products for under £13. I thought it was a great excuse to get some new conditioning treatments for my super dry blonde dip dye hair, which I talked about here. I'll do a proper review on them once I've had a chance to use them tonight, which Im planning on turning into a serious pamper evening due to the fact I've caught up on all my essays, woo! I'm planning on doing a little personal post later about something quite exciting (well exciting to me anyway...) so hopefully I'll get on it. Has anyone discovered any miracle products recently which I need to get my hands on? 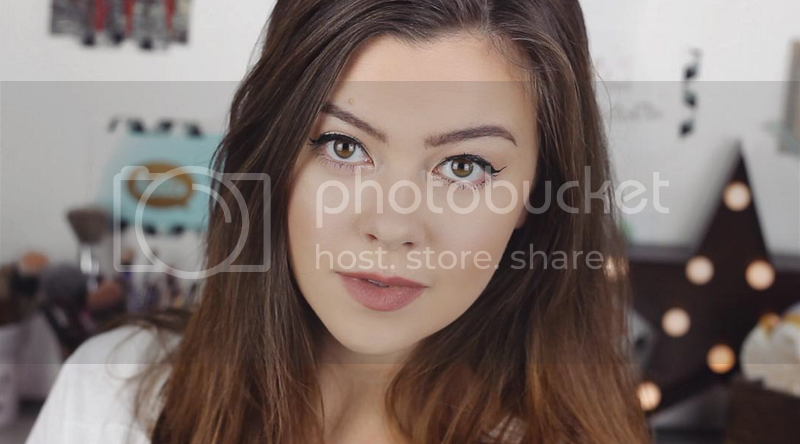 What are the products you just couldnt live without? Great review post! I've been thinking of getting some soap and glory products, I really want to try their eye cream that brightens the eye.. I think thats the gist that I got from the package ha! Also I agree with your boots comment, I go near enough every day before university and have a butchers around the place, I noticed the deals today so tomorrow I might get some goodies! I swear by my aussie lusious long shampoo and deep conditioner! Great products!